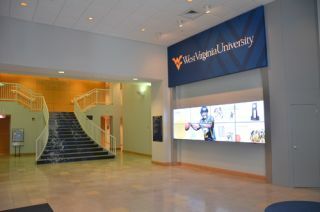 West Virginia University (WVU) is using X2O Media's Xpresenter digital signage platform to drive a new 2x4 video wall. Located in the lobby of One Waterfront Place — home to the WVU Visitors Center, admissions office, and more — the video wall provides a personal welcome to prospective students on campus tours. "Xpresenter has been powering our campus-wide digital signage network for the last two years," said Spencer Graham, manager of operations for WVU Information Stations. "We knew that the platform would deliver a remarkable visual experience for our video wall, while making it simple for our staff to schedule content." WVU's Visitors Center is the university's primary recruiting portal, and the use of cutting-edge digital signage technology makes a memorable first impression on prospective students and their parents when they arrive at One Waterfront Place. Visitors are greeted by an attention-grabbing video wall in the lobby consisting of eight 46-inch Samsung monitors. All video and graphic content is choreographed and then played out by Xpresenter in high video quality. To provide a personal touch for campus tours, each prospective student's name is featured on the video wall with a welcome message. "Xpresenter is a great product for standard signage, but its capabilities allow for so much more," Graham said. "Our video wall does a fantastic job of marketing the University. I can't wait to see what we do next with the platform."